Solar LED Street Lights are ideal outdoor lighting options that are reliable and alternative to conventional lighting to provide lighting from dusk to dawn. Each street light is powered by a solar module which converts sunlight into electricity during the day and charges the system's built in battery. 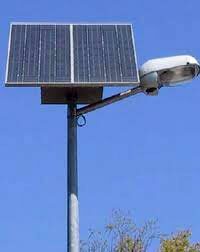 The Solar LED Street Lights on automatically at dusk using battery power and switches off automatically at dawn. The equipment is rugged with weather - proof components providing long and consistent performance.